It may be cool right now, but the summer heat will be returning here soon! What better way to cool off than with a refreshing summer drink — like this Watermelon, Pineapple and Mint Infused Water. It is summer, cool and fruity — all at the same time! 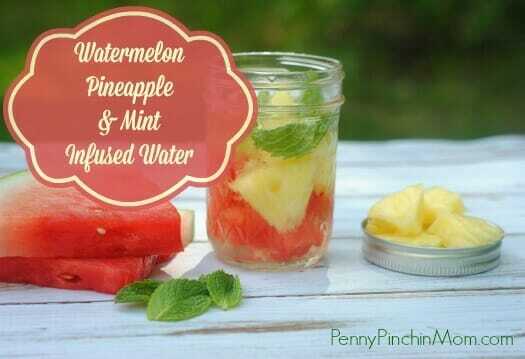 Add the pineapple chunks, watermelon chunks and fresh mint leaves to your 8 oz. canning jar. Next, use a spoon or a fork to gently mash the fruit down a little bit. This will let the juice out of the fruit to infuse your water. Fill the jar with water, place the cover on, give it a good shake and refrigerate overnight for the best flavor. **If you’d prefer to use a larger canning jar, simply double or triple the recipe ingredients and refrigerate overnight. « Hidden Deals at Target: Market Pantry Snacks, Ice Cream Treats And More!